Today, my mission was to do a WOD that I'd never done before. After scrolling through a list of the girls named WODs and Hero WODs I realized I'd never tried my hand at "J.T" (21-15-9 HSPU, Ring Dips, and Push Ups). In almost 3 years of CrossFitting, never have I been so humbled by a WOD. It took me 25 min and I had to scale the last 9 HSPUs with my feet up on a 48" box to keep from bashing my skull onto the concrete. At 6'2, 205lb I initially tried to rationalize my defeat on my height and weight, but I know there are athletes taller who also weigh more who can do this faster and completely RX'd. I'll not settle with this performance. I look forward to tackling "J.T." 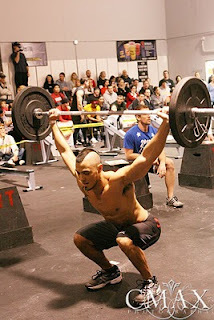 again before regionals, not scaling it, and bettering my time. Meanwhile, I've got my diet somewhat back on track. I'm increasing my daily caloric intake for the next month and focusing on strength. Throughout each of the next four weeks, my goal is to do 2-3 overlift/strength WODs, 1-2 metcons, and 1 chipper/endurance WOD per week. My rest days will be sprinkled in as needed. Although I try to plan ahead, my training schedule is always loosely structured so I can listen to my body and recover when needed.